President Moon Jae-in will leave for Washington on Wednesday for talks with US President Donald Trump. At the summit with Trump on Thursday, Moon is expected to focus on ways to restart denuclearization negotiations talks between North Korea and the United States that have been stalled since the collapse of the second Trump-Kim summit at Hanoi in February. People are paying attention to whether Moon could draw an agreement over denuclearization process, with the Americans seeking a big deal, a one-time solution, while the North Koreans favoring a phased step-by-step denuclearization. “I will visit the United States tomorrow (April 10) for a South Korea-U.S. summit. I will do my utmost for an early resumption of North Korea-U.S. talks,” Moon said in a Cabinet meeting held at his office Cheong Wa Dae in Seoul on Tuesday. “The upcoming South Korea-U.S. summit is being held based on the shared perception that cooperation between the two countries is important in reviving the momentum for dialogue in the wake of the Hanoi summit,” Kim Hyun-chong, second deputy director of the National Security Office, said. “Moon’s U.S. visit will be an opportunity to seek concrete measures for achieving complete denuclearization and establishing permanent peace while maintaining the top-down approach,” Kim said. 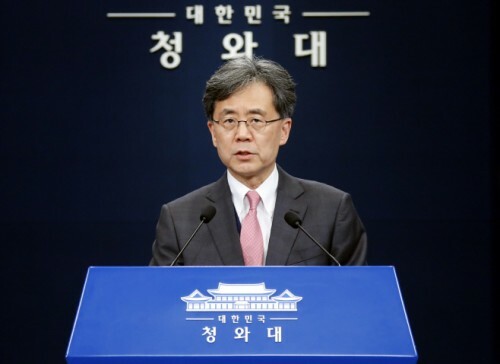 In particular, a Cheong Wa Dae official said, “What is important now is the end state of complete denuclearization.” He said that South Korea and the United State are on the same page regarding the “end state” of North Korea’s denuclearization and the need for a roadmap to achieve complete denuclearization. “The two leaders will talk in depth about this,” he said. However, the official said it is not appropriate now to talk about detailed discussion between the leaders. Whether the countries should offer phased rewards to the North will be discussed at the upcoming summit, the official said. The official also hinted at the possibility of Moon sending a special envoy to North Korea as well as holding a one-point inter-Korean summit. “President Moon Jae-in has the trust of both North Korea and the United States. It is expected that we will have a role this time around,” the official said.